Graphene is a single atomic layer of carbon atoms tightly packed in a two-dimensional honeycomb lattice. This novel material is atomically thin, chemically inert, consists of light atoms, and possesses a highly ordered structure. Graphene is electrically and thermally conductive, and is the strongest material ever measured. These remarkable properties make graphene the ideal support film for electron microscopy. A typical TEM image of graphene sheets freely suspended on a lacey carbon TEM grid. 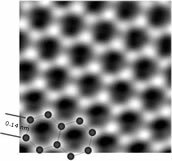 An atomic-resolution image of a clean and structurally perfect graphene sheet synthesized by the substrate-free gas-phase method. Individual carbon atoms appear white in the image. Elemental analysis by FT-IR reveals that the synthesized graphene sheets are free of detrimental oxygen functionalities. The FT-IR spectrum of synthesized graphene is similar to that of highly oriented pyrolytic graphite (HOPG). A low-magnification image of a (1) gold nanoparticle 10 nm in diameter on a (2) transparent synthesized graphene support film, (3) the vacuum, and (4) a lacey carbon support. 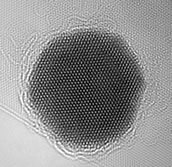 An atomic-resolution image of a 10 nm gold nanoparticle and its surrounding citrate capping agent on a synthesized graphene support film. A typical low-magnification TEM image of crumpled and randomly oriented large-area graphene sheets suspended on a lacey carbon TEM grid. Graphene is a single atomic layer of carbon atoms tightly packed in a two-dimensional honeycomb lattice. The novel material has generated great interest throughout the scientific and technological community because of its remarkable properties and numerous potential applications. However, obtaining pure and highly ordered graphene has been a challenge. Small quantities of ultrahigh-quality graphene have been isolated through an unwieldy and time-consuming process involving the mechanical exfoliation of highly oriented pyrolytic graphite. Alternative methods require substrates or graphite to create atomically-thin sheets, and these techniques involve multiple steps, expensive substrates, or non-ambient conditions. Furthermore, the sheets produced by these alternative methods exhibit defects, disorder, and oxygen functionalities that have a detrimental effect on the properties of graphene. The substrate-free gas-phase method is the first and only process that can synthesize ultrahigh-quality graphene in a single step, without the use of substrates or graphite . Graphene sheets are created through the delivery of liquid alcohol droplets directly into atmospheric-pressure microwave-generated plasmas. Extensive characterization of the synthesized graphene has proven that the sheets are oxygen-free and exhibit a highly ordered structure . The graphene produced by this unique method can immediately be utilized for graphene applications. The interfaces between soft and hard nanomaterials have been the subject of extensive research. Nanoparticles coated with molecular layers have been shown to self-assemble into novel structures that could potentially be used in electronics, sensors, and photonics. Self-assembly is influenced by the nature of molecular coatings and thus more detailed characterization of these soft materials is needed. However, imaging surface molecules and their interfaces with nanoparticles at the atomic scale is a significant challenge. The transmission electron microscope (TEM) imaging of functionalized nanoparticles has been attempted. However, it has not been possible to observe molecular surface layers and their interfaces with nanoparticles at the atomic level. Modern aberration-corrected TEMs can produce atomic-resolution images of soft and hard nanomaterials. However, conventional TEM support films (e.g. ultrathin amorphous carbon) limit the capabilities of these advanced microscopes because they contribute to overall electron scattering and diminish the contrast of low-atomic number specimens. The TEM imaging of the interfaces between soft and hard nanomaterials therefore requires better support films that have a lower dynamical interference with an imaging object . 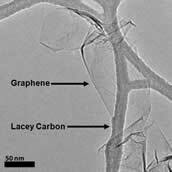 Graphene is the ideal TEM support film. 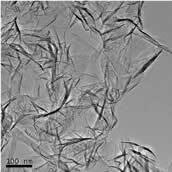 The material possesses a highly ordered structure and is atomically thin, chemically inert, structurally stable, and electrically and thermally conductive. The ultrahigh-quality graphene produced by the substrate-free gas-phase method [1, 2] has enabled the unsurpassed TEM imaging of organic molecules and the interfaces between soft and hard nanomaterials. The pure and highly-ordered sheets were used as a near-invisible support film to directly image the atoms in a gold nanoparticle and its surrounding citrate coating . The results showed that the synthesized graphene can be used to directly observe nanoparticles functionalized with a diverse range of molecular coatings, such as proteins and DNA. We offer ultrahigh-quality graphene that is produced through the substrate-free gas-phase method . The graphene created by this technique possesses a highly ordered structure that is composed of 99% carbon by mass (1% hydrogen). 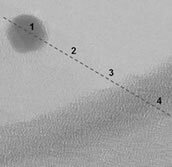 This graphene was used to directly image gold nanoparticles and their organic surface molecules in both conventional and atomic-resolution TEMs at a level that greatly surpasses any current TEM support film. Our graphene provides an invisible, crystalline background that enables the unrivaled TEM characterization of organic and inorganic nanomaterials. Dato et al., "Substrate-Free Gas-Phase Synthesis of Graphene Sheets", Nano Letters 8, 2012-2016 (2008). Dato et al., "Clean and highly ordered graphene synthesized in the gas phase", Chemical Communications, 6095-6097, (2009). Lee et al., "Direct Imaging of Soft-Hard Interfaces Enabled by Graphene", Nano Letters 9, 3365-3369 (2009). Galatzer-Levy, J. Graphene "sandwich" improves imaging of biomolecules. University of Illinois at Chicago News Center Web Site. February 4, 2014. Available at: http://news.uic.edu/graphene-sandwich-improves-imaging-of-biomolecules. Accessed February 12, 2014. Dato, A. and Frenklach, M., "Substrate-free microwave synthesis of graphene: experimental conditions and hydrocarbon precursors", New Journal of Physics, 12, 1367-2630 (2010). a) As a solution of 0.1 mg Graphene in 1 ml of Ethanol. A homogeneous solution will take less than 30 seconds to create by sonicating the Graphene-solvent mixture. One is able to coat their own grids using this solution. b) As Graphene-enhanced lacey carbon TEM grids. 200 and 300 mesh. These grids are created by coating our existing lacey carbon grids with graphene. Through a unique drop method, solution is dispersed onto the Lacey Carbon Grid. c) As dry, synthesized Graphene powder, 1 mg.